Synopsis: In the Society, officials decide. Who you love. Where you work. When you die. Review: This is just another typical YA dystopian novel. it also seemed really similar to The Giver by Lois Lowry… what is they say “Thank you for your childhood” or something. And in Matched they say something awful similar. I mean, nowadays, when you pick up a YA dystopian book you go in knowing it’s going to be similar to all the others out there. There are few that stand out or have an original quality about them. I felt no connections to any of the characters. Cassia was annoying (but I also was listening to the audio version of it and I find the voice actors for some of these YA’s have such annoying voices). She was also very very naive. Which, I mean, I get because this Society has made people believe that everything is structured for a reason and you just shouldn’t question it. Ky came out of nowhere. I feel like if Ky wasn’t thrown into the mix she wouldn’t have batted an eye. Like, this book would not have happened if he didn’t show up. She would stay matched with Xander and “the end”. but then she becomes obsessed with Ky because he’s different and then her eyes open to the world not being so perfect… Shocker! 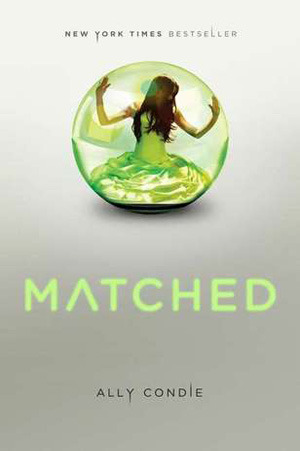 The Matching seems oddly similar to Delirium by Lauren Oliver. The love triangle was alright but nothing to write home about. Just another YA cliche! The world building was good though. I did get enough out of it that I could visualize everything that was going on. I got to say it was a little slow starting but the ending makes up for everything. I feel like it comes together nicely. The ending is really the only time you begin to “feel” for the characters and get a glimpse into the wrongdoings of the Society. It was an entertaining read (or listen rather) it just wasn’t that memorable. If they were to make a movie out of this (as I’ve read somewhere that maybe they are planning to) I think it would be better than the book. This entry was posted in ally condie, book review, matched and tagged book review. Bookmark the permalink.